Pegel’s core competency is in managing complex construction activities. We deliver these services in a variety of construction methods including, general construction, construction management and "design and build". Our team performs a wide variety of construction tasks producing top-quality work while streamlining the execution of a project. We plan, schedule and control the entire project and entrust our highly trained and qualified management team with this task. We offer a complete design and build service, relying on the skills of our team in analyzing and developing optimum design solutions. Our integrity and business professionalism shape the products and services we offer. Organizing a project requires discipline, accuracy, dedication and hard work. No matter what the delivery method, Pegel is able to take projects from concept to completion and save our Clients' time and money. We deliver a project that is cost-efficient, competitively priced, on time, every time. Pegel’s reputation among Clients, developers, and tenants is that of a company offering top-quality work, integrity and reliable performance. For optimal performance the team focuses on the development of a strong professional staff and sophisticated system support. Our quality associates along with our proven expertise in subcontractor management enable us to execute each construction contract with the highest degree of performance. We control all the elements most critical to a project's success, quality, schedule and cost. Include specific requirements for safety and quality in our bid documents. Inspect all materials upon receipt and continually monitor performance. To obtain timely and reliable project progress information, we use fully integrated automated systems for estimating, planning, cost control and document control that promote effective management of a project. With a wealth of experience in all types of construction activities, Pegel is able to draw on a full range of management and construction competencies which are necessary to successfully deliver projects. Pegel possesses the skills, knowledge and experience necessary to provide a world class construction management service to Clients in Europe and the Middle East. Pegel offers construction management services in various forms, depending on Client preference and project needs. 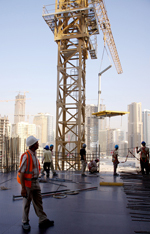 On an "agency" basis, we serve as the Client representative to optimize cost, time and quality; or we will handle construction management on an "at risk" basis, providing a guaranteed maximum price for the cost of construction of the project and taking on the dual role of construction manager and general contractor. Construction management is provided as part of an overall project/program management plan which, besides the construction management services described above, includes procurement and coordination of engineering and design. Our procurement services include developing and approving criteria for materials and equipment, developing bidding lists, evaluating bids and making recommendations to the Client, placing orders, planning deliveries and making site inspections. Pegel works in partnership with its Clients and suppliers to manage both the design and construction process from inception through to handover and beyond. We work closely with Clients to assess the need to build, develop a brief, design and deliver the project. Design-build is a method of project delivery in which Pegel forges a single contract with the Client to provide for architectural/engineering design and construction services. During the past decade the use and interest in design-build has greatly increased. With design-build, the Client is able to focus on scope, project needs, and timely decision-making, rather than on coordination between the designer and contractor. Singular total project responsibility - With both design and construction in the hands of a single entity there is only one company with accountability to the Client. The design-builder is motivated to deliver a successful project by fulfilling multiple parallel objectives, including aesthetic and functional quality, budget, and schedule for timely completion. Cost saving benefits to the Client - Design and construction personnel, working and communicating as a team, evaluate alternative materials and methods efficiently and accurately. Value engineering and constructability are utilized continuously and more effectively when the designers and contractors work as one team during entire design process. Quality - The singularized responsibility inherent in design-build serves as a motivation for quality and proper project performance. The Client requirements and expectations are documented in performance terms and it is the design-build entity's responsibility to produce the results accordingly. The designer-builder warrants to the Client that it will produce design documents that are complete and free from error, as opposed to the traditional design-bid-build where the Client warrants to the contractor that the drawings and specifications are complete and free from error. Time savings - Due to the design and construction overlap, Bidding periods are reduced to a minimum and the total project relization period can be significantly reduced. 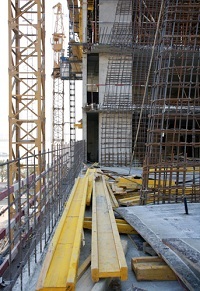 Design-build is ideal for the application of "fast track" construction techniques. With design-build, materials/equipment procurement and construction work can begin way before the construction documents are fully completed. The resulting time savings translates into lower costs and earlier utilization of the completed facility. Early knowledge of firm costs - Guaranteed construction costs are known far earlier than in other delivery systems. The entity responsible for design is simultaneously estimating construction costs and can accurately conceptualize the completed project. Staged contracting for design-build services affords the Client one or more "go/no-go" decision points during design. The decision to proceed with the project is made before substantial design expenditure and with firm knowledge of the final cost. Improved risk management - Change orders due to "errors and omissions " are virtually eliminated because the design-builder has responsibility for developing drawings and specifications as well as constructing a fully-functioning facility.